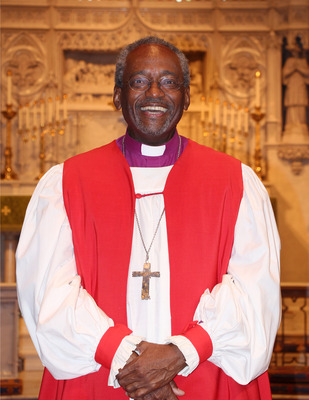 Bishop Curry was born on 13 March 1953 and reared in Buffalo, New York. He was educated at Hobart College, receiving a Bachelor of Arts degree in 1975. He trained for the ministry at the Berkeley Divinity School, receiving his Master of Divinity degree from Yale University in 1978. He was ordained deacon and priest in 1978 and served as deacon in charge, then rector of St Stephen’s Episcopal Church in Winston-Salem, North Carolina. From 1982 to 1988 he served as rector of St. Simon the Cyrene Episcopal Church in Lincoln Heights, Ohio and as rector of St James Episcopal Church in Baltimore, Maryland from 1988 to 2000. He was elected the eleventh bishop of the Episcopal Diocese of North Carolina on 11 Feb 2000 and consecrated on 17 June 2000. On 27 June 2015 he was elected on the first ballot by the House of Bishops of the Episcopal Church meeting at the 78th General Convention to be the 27th Presiding Bishop of the Episcopal Church. He is the first African-American elected as a diocesan bishop in the American South and the first to be elected Presiding Bishop. He is married to Sharon Curry and they have two daughters.